Curator Kate Steciw is one of 8 artists in the exhibition, most of whom use digital collage to reconfigure, re-materialize, and reproduce common imagery. Steciw’s digital collage sits in a teal triangular frame jutting perpendicular from the wall, exposing the backside of the stretcher where embroidered cob web patches are wedged into each corner. 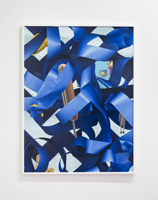 It’s content – images of leather, fabric, food – echo in Asha Schechter’s framed C-print, a digital collage depicting objects caught in a tangle of blue artist’s tape. Some of these objects – a teddy bear, a burrito, a bow tie- are also re-presented as disparate vinyl cut-out stickers, subtly placed in unexpected spots on the gallery walls. The trail a teardrop makes as it rolls down a cheek creates the form of Rachel De Joode’s Tears – worm-shaped photographic prints adhered to hand shaped plaster and held by plexiglass dowels sitting on six tiered pedestals. The high definition, photographic quality of the isolated images is met with the artists hand, which has literally left fingerprints in the white hardened plaster. The warm human feel of Tears contrast with Yannick Val Gesto’s cool and eery prints on plexiglass in which handwritten text and figurative drawings are layered with computer generated graphics. Harm Van Den Dorpel’s Assemblage – a hanging sphere made from long rectangular sheets of printed plexiglass – documents feels overwhelming in the small gallery. Likewise, De Joode’s installation translates beautifully as an image yet they way in which it is displayed – distract a bit from its uncanny elegance in person. Though perhaps unintentional, the discrepancies between the gallery show and its documentation seem to fit right in line with the exhibition’s concept. Images mutate as they are taken on and off the screen and are used as source material for these artists who remove them of context. Ultimately, the beauty that Steciw speaks of in our modern life, is well articulated –Steciw’s vision is clear and direct, and while the exhibition is in dialogue with our post-Internet condition, it must be seen in person.